In 1980s North America, everywhere you turned there were warnings about a widespread evil conspiracy to indoctrinate the vulnerable through the media they consumed. This percolating cultural hysteria, now known as the “Satanic Panic,” was both illuminated and propagated through almost every pop culture pathway in the 1980s, from heavy metal music to Dungeons & Dragons role playing games, Christian comics, direct-to-VHS scare films, pulp paperbacks, Saturday morning cartoons and TV talk shows —and created its own fascinating cultural legacy of Satan-battling VHS tapes, music and literature. As the hysteria moved overseas to the UK, Australia and South Africa, its life extended into the 1990s – and some say it never went away. 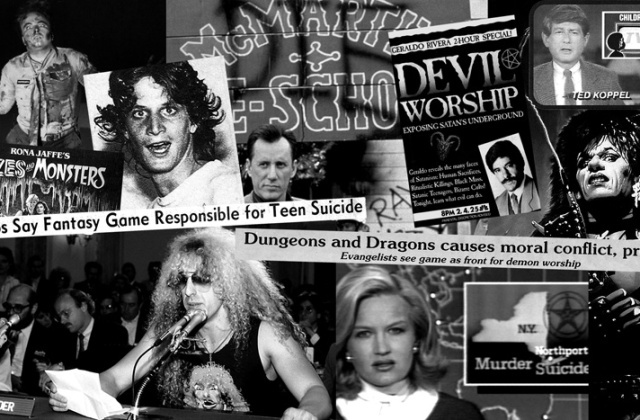 From con artists to pranksters and moralists to martyrs, this lecture – based on the instructors’ book of the same name, which will be available at the screening – aims to capture the untold story of the how the Satanic Panic was fought on the pop culture frontlines and the serious consequences it had for many involved. Read more about the SATANIC PANIC book HERE.